Newmarket-Aurora voters can expect something different this time around from Green Party candidate Vanessa Long. Case in point, she says, was a locally televised debate she characterises as everyone yelling over each other. Instead, Ms. Long says she is focused not only on taking the Green Party platform to voters but, in the process, instilling hope that their vote does indeed matter. “For most people, what I have been hearing is they just don’t see a choice,” she says. “[The thought is] the economy is going to do what it is going to do, it doesn’t seem to matter who is going to be in charge, they are pretty much going to do the same thing. I am hearing a lot of frustration with the incumbent party, but you’re always going to hear that when you have a party that has been incumbent for as long as the Conservatives have. As she goes door to door, one of the Green Party planks she is most proud to explain is how the party would tackle what she describes as an “accelerating income gap” in Canada. The wealthiest two per cent of the population are getting wealthier and more people are falling off the bottom rung of the middle class ladder, she contends. Locally, more and more people are taking advantage of programs and services offered by organizations like the Salvation Army and local food pantries and the need for such programs shows no signs of abating. This entails focusing on developing a sustainable manufacturing sector across the country rather than “resource extraction and exportation,” she says. Citing the party’s Vision Green platform, a blueprint of what Canada might look like by 2020 under a Green Party government, Ms. Long says addressing this income gap will go a long way. The Greens, she says, are very big on income distribution through taxes. Income is a “good thing”, she says, and rather than taxing the good things, a Green government would instead tax the “bad things” like pollution and choices that are less than environmentally conscious. Ms. Long grew up in Alberta amid the oil industry and an environment that was decidedly Progressive Conservative. 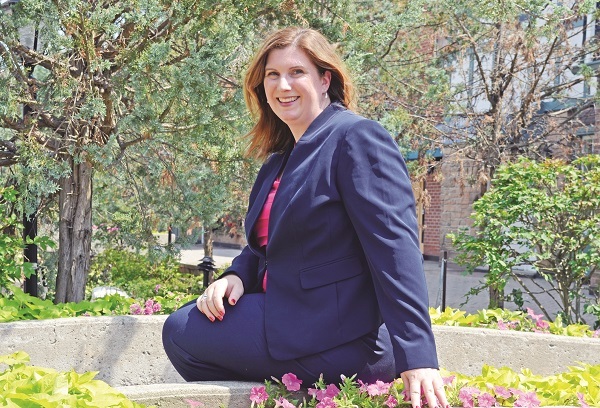 Although she says the Progressive Conservatives of Alberta are a different thing altogether from the Federal Conservatives, she says there was probably a time when her own politics leaned in the PC direction. But, after the 2004 election, she sat up and decided if she cared about the world around her it was time to get involved – and she found a more natural fit with the Green Party. Canada was once seen as “fair arbiters” on the world stage, a status she says has been tarnished. The country needs to renew its commitment to the United Nations, the Kyoto Protocol, peacekeeping and social justice. And, through proportional representation, Canada needs to ensure every vote matters. “For me, success come in two directions. Nationally, I would love to see several Green MPs in a minority government that have the power to actually hold whoever is in charge to account, to move them towards a greener, more socially just Canada, to make sure they actually repeal Bill -51 and do the things they are promising to do.